You write great content but what if your website takes decade to load? Well, Visitors don’t have patience and It has been proved. More than quarter of visitors will abandon your website if it takes more than 3 seconds to load. Your potential visitors even might hit back button in browser before they read your content. Hitting back button is a direct message to search engine that user did not get what he was expecting on a page and next time your content might rank lower. PageSpeed is a ranking factor – Google has already said that page speed will be one of the ranking factor for their search index and search engine gives more value to pages which load fast. User Experience – Slow loading website gives a bad user experience. User can navigate easily to different pages on a fast website which results in increased total page views and decreased bounce rate. Conversion rate – Don’t you want to see your visitors converting in your customers? Fast web page improves conversion rate. Amazon once announced that conversions dropped by 7% every time their website was loading late by 1 second. SEO – Fast websites are definitely rewarded by search engines. Speeding up a website can be first step towards Search engine optimization. Hosting Resources – If your website is optimized, then it won’t be needing a lot of hosting resources to run smoothly. If you are on shared hosting and websites is not optimized and consuming and exceeding resources limit then your website might go down. Hope you have understand the importance of pagespeed by now. So, are there any tools for measuring pagespeed or loading time of a website? Yes there are. Google PageSpeed, Pingdom and GTmetrix are recommended tools for analysing a website’s performance. You can get exact idea what is causing performance issues on your WordPress website. Some of the most common problems behind a slow website might be Heavy unoptimized Images, Dense Coding, Too many advertisements, Unreliable Host, Embedded Media, Unoptimized plugins, lot of java scripts etc. The speed of WordPress Websites can be greatly increased by doing simple things here and there. I have learnt a lot of lessons in past few years. Although hosting alone can’t make your website fast, you have to work on various aspects on frontend but it does matters a lot. If you choose shared hosting then remember there might be hundreds of other websites on the same server and you have very limited resources to keep site running. Whereas with VPS and Managed WordPress hosting, you get better performance. So before choosing any hosting plan, consider how many visitors you have and how much hosting resources do you need to handle traffic smoothly. WordPress hosting is exclusively optimized for WordPress websites. You can skip a lot of optimization steps mentioned in this post just by going with WordPress hosting. For an example you don’t need to install caching plugin on Godaddy WordPress Hosting because their servers provides inbuilt caching. WordPress hosting can be of different types such as Shared, VPS and Managed WordPress Hosting. Be careful while choosing Data Center for your website. You get an option to choose data center location while buying hosting. If your website targets visitors in a certain reason of the world, choose a data center location nearby. Say your website is only for Indians, so you should choose data center in India or Asia so that your target users can access your website faster. Although visitors from a far region will experience slow loading of website but you can address this issue using CDN. First your theme should be responsive means it should be perfectly optimized for all browsers, screen sizes and devices. Second it must be well coded, lightweight, clean, secure, search engine optimized and robust. On this blog I am using Genesis framework and quite happy with its speed. A standalone theme can be faster than a theme with framework. Everything comes with some cons and pros. WordPress default themes like twenty thirteen are also well coded and fast. Actually you get an option to choose data center location for your website while purchasing Hosting. Say if your website is hosted in a data center in Europe then your website will take little more time to load when accessed from Australia or America while European visitors will see it loading faster. It is simple. Site will load faster for users who are lives near data center your website is hosted on. CDN(Content Delivery Network) is a great way to address this challenge. Your website’s files such as scripts, images, css are hosted on various data centers(Provided by CDN) around the world. Now no matter where the user access your website from, the content is delivered from the nearest data center. This way CDN greatly reduce the loading time of website. CDN not only reduces the number of requests but also saves bandwidth by a great extent. 2 popular CDNs are Cloudflare and MaxCDN. Using a caching plugin is a crucial for speeding up any WordPress website. Installing a caching plugin is perhaps the quickest way to cut loading time down significantly. Let’s see what a caching plugin do. Whenever someone visits your website, some information are requested from your web host such as HTML, images, fonts, Scripts, PHP files, Posts, pages etc. And to make sure visitors are viewing up to date information, WordPress generates content dynamically means requests for fresh informations are being made every time visitor visits that page. But as you know we don’t update posts and pages very frequently so why should we make a returning visitor wait every time even when he is requesting the same post/pages. This is where a caching plugin comes into play. It creates static HTML version of web pages and delivers cached version of the page to the returning visitor and thus greatly reduces the number of http, php and mysql requests made. And this is how our website loads fast. Enabling Gzip compression reduces the size of files sent from your server to browser. It can reduce the size of the page by more than 50% and hence saves a lot of bandwidth. So how do you know if Gzip is enabled or disabled on your website? You can use online tools such as GTMetrix. Caching plugin such as W3 Total cache also support enabling Gzip compression. It is advised to take a backup of these files before you do anything. As its name suggests, minifying is the process of reducing the size of JS and CSS files by removing unnecessary comments and white spaces from the files. Smaller files load fast. You can minify JS and CSS files using plugins. You don’t need to install a seperate plugin for it. If you have caching plugin installed, you can get this done. Images take a lot of storage as well as time to load. But did you ever know the size of images can be reduced without compromising the visual quality. Yes WP-Smushit is the plugin which reduces the size of images significantly using lossless compression technique. You need not to worry about already uploaded images. The plugin can handle already uploaded images as well as new images during uploading process. Another plugin is Lazy Load which makes sure that image will only be loaded when the area becomes visible to user. One other thing you can do is enabling Jetpack Photon Module. Since It delivers images using globally distributed CDN, images load faster. Small theme images such as logos at footer can be combined into one image using CSS sprite to reduce the no. of requests for the web server to process. Specifying Image Size will a plus for your website speed. Actually browser figure out how to arrange content around image. So if you don’t specify the size of images, browser can take longer to figure this thing out. This is one thing I do regularly and usually at the end of optimization process. Database gets messy over time. Empty spaces are left on database files after queries are executed. These spaces adds up and might affect MySQL performance. Optimizing database removes these empty spaces from files. You can use Wp-Optimize, WP-dbmanager or any other plugin to repair and optimize MySQL database. Only install a well coded, regularly updated and well optimized plugin because poorly developed plugins might cause performance issues. Also don’t forget to remove plugins which you are not using. You can find troublesome plugin using P3(Plugin Performance Profiler) plugin. It will give an idea which plugin is consuming more hosting resources. You can later replace those plugins with better one. Don’t keep P3 plugin installed once you have find the culprit. Google does not like Broken links. Broken links lead your visitors to nowhere and increase bounce rate which is not a good thing. You can find all the broken links using broken link checker online and remove them manually. Actually broken links consume bandwidth and does not serve any purpose so they need to be fixed. Don’t forget to replace “yourwebsite.com” with the name of your website. Everytime you hit save draft button while writing a post, WordPress saves version/revision of the post. It enables us to view and restore any old version of the post later. 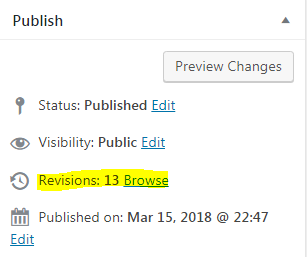 3 is the number of post revisions. Pingbacks and trackbacks serve no good purpose. You can turn them off by going to Setting>>Discussion . Installing an antispam plugin is vital, otherwise your website will be flooded by spam comments. Akismet and Antispam Bee are two popular plugins to block spams comments and spam form submissions. 7 is the number of days after wordpress will delete your trash. So these were some tips you can follow to speed up and optimize your wordpress website. Hope you will find this post helpful. If so share it among your friends.